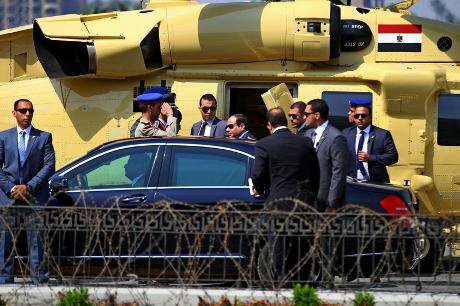 Abdel Fattah Sisi enters the presidential car. Hussein Tallal/Demotix. All rights reserved.There can be no doubt that we are witnessing a clear victory for the counter-revolution and confirmation of the end of the first wave of the Egyptian revolution. This does not mean, however, that the counter-revolution’s victory is final, nor does it mean that the revolutionary process has run its course. But it does mean that we are facing a new kind of challenge which requires serious study in order for revolutionaries to be able to confront and eventually overcome it. The coronation of Abdel Fattah El Sisi as president of Egypt has taken place over the corpses of the revolution’s martyrs and with the largest wave of detentions in Egypt’s modern history. He has received unprecedented support from big business, from all the security, judicial and religious institutions of the state and from massive privately-owned and state media institutions which are under the direct control of the secret police. He has brought in repressive laws which have not only hugely restricted the space for political action, but have even clamped down on social and economic demands under the cover of the “war on terrorism” and the need to save the state from the effect of the cracks which the revolution of 2011 opened within it. Perhaps the most important lesson of this counter-revolution is that to underestimate the strength and power of your enemies is a fatal mistake. Whatever we might call El Sisi – pimp, traitor, murderer – he is a formidable opponent. If we want to defeat the counter-revolution and begin to prepare for the next revolutionary wave, we must reject the logic which claims “you can’t”, because El Sisi is capable of sending us back to point zero with a successful counter-revolution with popular backing among the middle class and large sections of the poor. But there is a long road from the present situation to the elimination of El Sisi and his men and women. It is a road which demands sound strategic vision and the capacity to set appropriate tactics. The process of building revolutionary organisation is characterized by patience, perseverance and working for the long haul. The second contradiction, which the economy of the counter-revolution is suffering from, is the huge gap between the enormous expectations among wide sections of the middle class in particular, whipped up by the private and state media machine, that they will see a tangible change for the better in their living conditions. These expectations will quickly run up against the regime’s right-wing, austerity policies. And any serious attempt by El Sisi to adopt populist policies, even on a temporary basis, will run into that other impregnable wall: the interests of big business and the Gulf investors. The principles of neo-liberalism are a red line, and a condition for the latter’s support for military rule. When El Sisi talks of imaginary leaps and jumps that the Egyptian economy needs to make, he is right. For Egyptian capitalism to return to competitiveness this requires the fundamental transformation of the economic infrastructure (fixed capital). This means building nuclear power stations to solve the energy crisis, new road and rail networks, and educational institutions to develop new skills. Over the past half century, Egyptian capitalism and its state have invested in raising productivity through numerous failed projects. The problem with these kind of projects is that they need two factors which El Sisi does not have: massive funding and time. The funding of such huge projects cannot be achieved using private capital either from the Gulf or locally, because these infrastructure projects will only achieve profitability after many years, or even after decades. Repairing the railway network, for example, will cost tens of billions of dollars and take at least ten years. Building nuclear power plants would cost at least double that amount and they will not start producing energy until at least fifteen years after beginning construction. No austerity programme can deliver the necessary funding, even if the mad General slashed wages and doubled working hours. So how will the economy look between now and the distant future? El Sisi’s regime will remain wracked by crises: an indebted, corrupt, obedient beggar, dependent on Saudi Arabia, the UAE and the USA. Meanwhile the mentality of the military bureaucracy in dealing with economic planning will lead to catastrophes and giant projects on paper which are empty of any substance (by playing with the geography of the provinces for example). This does not mean that the regime is about to collapse, as the Brotherhood are endlessly repeating, nor does it mean that a second revolution is at the gates. Economic crises do not in themselves lead to collapse or revolution. For the essence of El Sisi’s popularity lies in a mixture of expectations and fear. Fear of the collapse of the state, fear of chaos, civil war, terrorism and the collapse of security. Fear that the rise of ISIS in Iraq and Syria is the future. There is a strong desire for stability at any price among large sections of the middle class, and significant sections of the working class and poor. However, the January Revolution created unprecedented fissures in this edifice, even shaking the pillars on which it balanced: the collapse of the police and State Security, and even embryonic rebellions in the ranks of the army, the collapse of the venerable institution of the presidency, which always used competition between the different institutions of the state to retain its powers. Perhaps the principal role which El Sisi has played, and which has propelled him into presidential office, has been to save this system from fracture and collapse. There is no doubt that he was the mastermind on the Supreme Council of the Armed Forces of the battle to preserve the coherence of the state. He played a pivotal role as the director of Military Intelligence in preserving the unity of the army and preventing the revolution from leaking into its ranks (we will not know all the details of this until after he has been overthrown). He played a major role in the rebuilding of the Interior Ministry and State Security, and in preventing the clashes between the police and army from getting out of control. In the beginning, the Brotherhood helped him, but he completed this mission over their corpses. Yet the Egyptian state remains severely fractured across all its institutions. El Sisi’s moment as the leader who is the savior and unifier will not last long. For there are networks of interest and centres of power and the balance between them is very difficult to restore. Perhaps the fatal weakness in El Sisi’s regime (god willing) is his lack of a genuine political party. It is no longer possible to rely on the machine of the old National Democratic Party which wants to return to its previous ascendancy in its full powers (note the paralysis or abstention of this machine during the presidential elections). El Sisi’s popularity, of course, lies largely among his backers in the middle class, but this is not organized in the form of a party with a clear ideology and structure. Nationalist hysteria and panic among the middle classes are not, on their own, enough to convert these masses into an influential political party. The current harmony and unity within El Sisi’s camp essentially rests on a negative, temporary basis: the eradication of all traces of the revolution, and even the complete elimination of the only mass reformist party in the country, the Muslim Brotherhood. The more that the impossibility of these tasks is revealed, the greater contradictions and splits appear among the dictator’s allies. What we have seen in terms of splits among Tamarod and the Popular Current and their transformation from complete subservience to El Sisi to a limited degree of criticism and opposition presages splits on a deeper and more important scale. Here, the bourgeois media and naturally behind the scenes, the security services, played a pivotal role in focusing the entire attack on the Brotherhood alone. The “secular” reformist leaders justified this in a classically opportunist manner. According to the logic of their position, the Brotherhood was an obstacle to the completion of the revolution and it was necessary to get rid of them first, and only afterwards deal with the remnants of Mubarak’s regime. Therefore they saw raising slogans and demands against the army, the police and Mubarak’s supporters during the battle against the Brotherhood as weakening the movement to overthrow them. The natural conclusion to this opportunist logic (which was Stalinist in its stagism), was to argue for the necessity of an alliance between all elements opposed to the Brotherhood, regardless of the position they took towards the revolution and its demands. Not only an alliance with Mubarak’s supporters, which began early on with the creation of the Salvation Front, but more importantly and dangerously, an alliance with the steel heart of Mubarak’s state: the army, police and security services. Thus 30 June did not come as the crest of a revolutionary wave travelling in the same direction as the wave of January 2011 but in reality to pave the way and to provide a popular mandate for counter revolution with a military coup, with its massacres and arrests. But what happened on the day itself was enough to confirm that the balance of forces was not at all in our favour. For despite having the appearance of a million-strong demonstration and despite the chants of “the people want the downfall of the regime” the social and political content of this mobilisation and these slogans had been transformed into the opposite of the previous waves of the revolution. For the most influential mass element in the protests and the one which dominated was the secular middle class – Muslim and Christian, men and women – who were dominated by a state of hysterical hostility towards the Brotherhood, mixed with hysterical adulation and celebration of the army, and even the police: the same police which the first revolution had ripped to shreds, and the same army which millions chanted against and against its Supreme Council during 2011-2. Another thing which caused confusion about the nature of 30 June was a wrong and simplistic understanding of what we call “the masses” or “the people”. It is not only that the people and the masses are divided into different social classes but even different sections within each of these classes adopt and express varying degrees of consciousness and are thus motivated and driven by the slogans and demands they adopt. However, besides all of these complications there was another source of confusion among the revolutionaries (and of course we were among them) towards what was happening. And this was a range of perspectives on the nature of the Muslim Brotherhood. Since the 1990s, the Revolutionary Socialists have adopted an analysis of Islamist movements, and at the head of them the Brotherhood, which strongly contradicted the position taken by most of the Egyptian Left from Al-Tagammu Party to the Egyptian Communist Party with smaller groups which are no longer in existence such as the People’s Socialist Party and the Communist Workers Party. For from the point of view of the Marxist Left, and the working class, on whose behalf all of these factions claimed to speak, nothing is more dangerous than fascism’s arrival in power. This analytical contradiction was what led in the end to the unity between these sections of the left and Rifaat al-Said and collapsing into the arms of El Sisi after the Brotherhood came to power. This is not the place to present a detailed Marxist analysis of the Brotherhood (which is present in the classic writings of the Revolutionary Socialists and freely available on our website). What we must emphasize here is our description of the Muslim Brotherhood as a reformist movement, carrying within it class contradictions and with a socially conservative outlook. The position that it is not a fascist movement and has no link with fascism, has been proved completely correct as the Brotherhood have moved from opposition to power and then to prison. The army, with the support of the secular reformist forces, used 30 June as the cover for a military coup and for the transformation of the anger against the Brotherhood into a bloody mandate not only to eliminate the Brotherhood, but to wipe out the 25 January Revolution. What began with massacres and arrests among the ranks of the Brotherhood, quickly became an all out war against whoever took part in this revolution and against all its principles and demands. It is this war which is being celebrated now, a year after its beginning. This piece was orginially published here on 2 July 2014.